The Robbins Hunter Museum reopens on April 4! Wednesday through Saturday 1 p.m. to 4 p.m. In the gardens at RHM more than 400 varieties will bloom this spring . The weekend of April 14 and 15 in Granville will be a weekend to celebrate the cheerful harbinger of spring, the Daffodil flower. 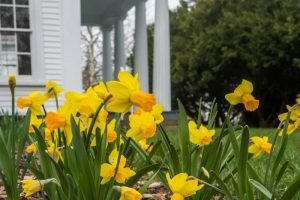 Saturday the 14th is Garden Day at Robbins Hunter Museum, coinciding with the annual Daffodil Show at Bryn Du Mansion that weekend and the day’s schedule is full. Notable to RHM’s Garden Day is the American Daffodil Society’s (ADS) recognition and dedication of the Jill Harms Griesse Historic Garden at 12 noon.